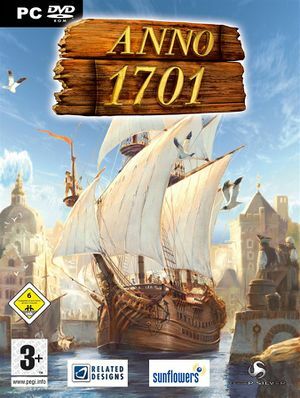 Also released as 1701 A.D in North America. English copies use TAGES DRM, Russian copies use StarForce 4 DRM[Note 1] and Chinese copies use SecuROM 7 DRM. Includes the "Sunken Dragon" expansion. Patches are available. A Patch 1.04 is available for the US release. Download the Anno 1701 intro skip. Extract data11.rda from the zip file to the Anno 1701 installation folder. Change <ScreenFormat>0</ScreenFormat> to <ScreenFormat>1</ScreenFormat> in Engine.ini. Camera scroll speed slider, but not mouse sensitivity. 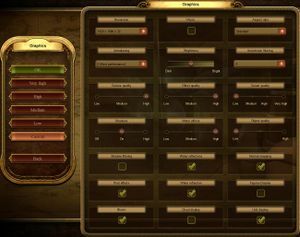 Master, music, speech, sound effects, unit, environment and news sliders. Only in fullscreen mode or when minimised in windowed mode. ↑ 2.0 2.1 File/folder structure within this directory reflects the path(s) listed for Windows and/or Steam game data (use Wine regedit to access Windows registry paths). Games with Steam Cloud support may store data in ~/.steam/steam/userdata/<user-id>/7870/ in addition to or instead of this directory. The app ID (7870) may differ in some cases. Treat backslashes as forward slashes. See the glossary page for details.